Are vaccines really that meritorious? Do they really prevent disease or could they, heaven forbid, precisely help to cause disease rather than cure it? Swine Flu – Vaccines, Cure or Cause? Swine Flu – Is the Disease Really Worse than the Cure? A tantalizing video in which Dr Blaylock elaborates on the connection between nutrition and (criminal) behavior. It is shown that bad behavior and bad nutrition are inseparably linked. In addition, the development of a variety of health afflictions and diseases (ADHD, Schizophrenia, depression, migraine, anti-social behavior etc..) is highly sensitive to improper dietary habits. As such, in many cases diseases of this type can simply be reversed by beneficial dietary adjustments instead of resorting to toxic medication to merely ameliorate the symptoms and thus ignore and cover up its root cause. An invention by the Nazis to dumb down and psychologically repress camp-inmates, it is hardly a surprise that fluoride compounds have a myriad of neurotoxic and poisonous properties. The evidence speaks quite clearly that fluoride compounds should be outlawed banned for public consumption. The way to do this is to educate yourself and your social circle on the atrocious nature of these stupifying and toxic compounds. Rid fluoride from your tap water as thoroughly as possible and use alternatives to fluoridated toothpaste. In addition, be keen on using no edible products containing fluoride. Read the labels. Perhaps only by a systematic boycotting and banning of products containing fluoride can a halt be put to the prevalence of fluoride compounds and its immoral infusion in myriad of consumer products. […]personifying robots no doubt earns the sympathy of many young and naive viewers and there stands nothing in the way of viewers to even identify with the robots. Depicting robots sympathetically and which have literally superhuman powers reads like an effective advertisement regarding the merger of man and machine. By making robots come across as friendly and protective (the Autobots only though, not the Decepticons) the viewer is predictively programmed to look favorable towards a future in which man will be drawn closer to machine either by augmenting machines with human characteristics or by endowing humans with machine like qualities facilitated by neural implants. In short, humanizing machines while dehumanizing man. The latter is a most worrisome prospect to anyone preferring to be a flesh-and-blood sentient human being who enjoys his or her autonomic mind and takes pride in his or hers individuality, as opposed to being an essentially soulless and unconditionally obedient machine reminiscent of a human. A sudden surge of collective suicide secretly precipitated, through biological warfare, by the powers that be, but made to look as if it was brought on as the wrath of nature. If society is brought into a crisis, releasing a biological agent while using nature as a cover the perpetrators are given a cunning form of plausible deniability. Added Death Race (2008 ), on the rise of the modern-day prison gladiator and the Prison Industrial Complex. Added Independence Day (1996). Also a very important movie in that it helped to prepare the public into accepting a simple but deceptive terror paradigm of good, the patriotic American citizens, versus evil, the perceived demonic enemies of America. Immediately following September 11 2001, the media began their barrage of showing us various footages of disintegrating WTC towers, over and over again, ad nauseum. Those who have watched ID thus have had ample opportunity to recognize the destructive real life events being similar to the fictional ones as portrayed in the movie. Thus, by virtue of this kind of recognition and familiarity gained from fictional imprinting, the witness is led into accepting a context of response similar to the one as presented in ID. In the movie, a clear identification is made of the enemy and a clear distinction is made between forces of good, that being the world in general and the US in particular, and forces of evil, that being the alien invader from outer space. Added Swordfish (2001). This is quite an important movie as it details government involvement in procuring funds, through illegal means, as a means to support its counter-terrorism operations. Added Things to Come (1936). Yeah I know it’s a crappy old movie. But don’t let that put you off as it is, precisely by virtue of its age, an excellent testing ground to see if any featured predictions have come true. If they have, which is indeed the case, the raison d’etre of the programming is thus validated. “In Minority Report it is being advertised and bragged about that, through pre-crime, murder-rates have plummeted to negligible levels. Therefore, of and by itself, the notion of pre-crime is presented to the viewer as being not something that is altogether disadvantageous to society. The great downside of pre-crime is type of intrusion and indeed the violation of privacy associated with the imposition of a pre-crime system onto the public. Through movies like Minority Report the viewer is acquainted with the idea that there will come a time in which there will be no such thing as privacy and that all the things that make you who you are, including not only all the superficial things such as shopping habits etc. but also deeply personal things such as medical history, will be up for grabs and ready to be exploited by all kinds of commercial entities as well as governmental (“Big Brother”) agencies. The realization of a pre-crime system therefore ultimately boils down to increases in governmental control and less freedom for its citizens. The mantra never changes, sadly. Predictive Programming – Predictive… What? If insane people are regarded as sane by insane people then, conversely, sane people will be regarded as insane by those same insane people. Founded on the above dubious moral axiom, which may be translated as, The end justifies the means (A), in the 16th century Niccolò Machiavelli formulates the classic dissertation on how to acquire and preserve raw political power, come hell or high water. By his own volition and on a proverbial silver salver, the tactical philosopher annex historian humbly offers to his highly esteemed ruler, the Prince(*), a self-guaranteed fail-safe recipe for robust rule–elegant in writing yet gloomy in meaning. Drawing from an extensive variety of modern and historical ruler-ship examples, combined with a deductive reasoning that is consistently lucid albeit infused with demeaning prejudices and stereotypes in its evaluation of human nature, Machiavelli distills a set of strategical rules and instructions for any ambitious ruler to abide by in order to secure and hold on to governing power. In this analysis I focus on Machiavelli’s treatise in the function of being a literal instruction manual for power acquisition. Courtesy of the universal range of its applicability, it should be kept in mind that not just members of aristocracy could seek to benefit from this work but potentially anyone who has power aspirations as well as lack of scruples. In today’s upper regions of power The Prince may, for example, draw to its teachings: politicians and government officials, military commanders and intelligence officers, bankers and stock brokers, industrialists and corporate moguls but also members of religious orders and church leaders more interested in expanding temporal power than in improving intimacy with God. In the lower echelons of power, The Prince may attract organized crime figures, gang-bangers eager to ascend in prominence, cult leaders and other flavors of dilettante megalomaniacs. 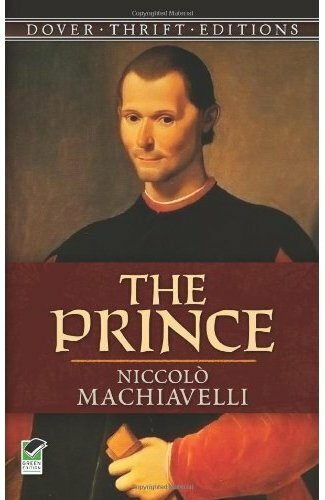 While abstaining from delving into such academic questions as to whether The Prince was actually intended as a work of satire or whether or not Machiavelli’s ruler actually came to read it, I set out to explore the moral and psychological foundation and ramifications of this sinister work of instruction. Note: For better readability, this article has been transferred to my other blog. It can be read in its entirety, here.